Since 1984 Fiorindo Family manages the Hotel Villa Garda, taking good care of the needs of their guest. Simplicity and courtesy complete the atmosphere of Hotel Villa Garda. 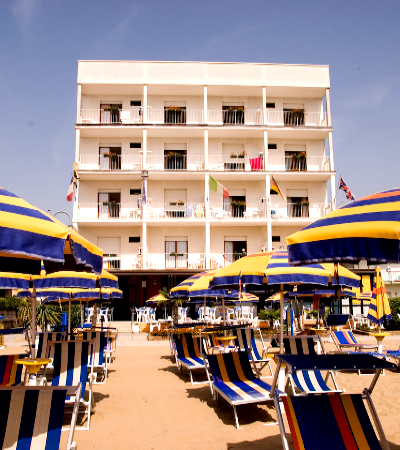 The Hotel is situated on the sea front, in a lovely quit position in the centre of Jesolo, nearby the pedestrian area with its shops, restaurants and pubs. The Menù of our cooking, tipical Italian cooking, varies every day to satisfy the tastes of our guest. You can relaxing in our terrace with sea view where you can taste the speciality of our snack bar in a particular atmosphere. Our Bathing Establishment “Stabilimento Balneare Marconi” organizes every day on the beach games, fitness, dancing. Jesolo offers more than beach and sea.